Bailey Winfield began his career with Terracare in 2013 and has continued to make a positive impact at our Centennial branch. 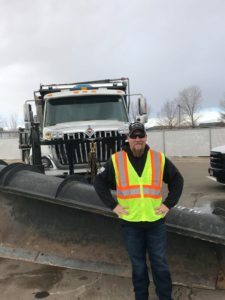 He began his career with TCA as a Snowplow Driver and continued on to a public infrastructure General Laborer, then transitioned to Asphalt Crew Member. From there he went to be a Yard and Sweeping Foreman and Trainer and currently is an Assistant Production Manager. Bailey’s career at Terracare however is only half the story. Before he began his career with Terracare, he enlisted in the United States Army, serving as a sniper and a Platoon Sergeant in Afghanistan. He also was responsible for managing 23 million dollars’ worth of equipment. This experience in the army combined with his understanding from working his way up at Terracare has made for a phenomenal leader. As Ruben Alonso Garcia Hernandez, a Labor Maintenance Crew Member who reports to Bailey said, “he is one of the best leaders we have at Terracare right now because he understands what it’s like to be in the field. He worked his way up from the bottom to where he is now. He can really relate to the crews he is in charge of and he builds them up with the understanding he gained from being in their same position throughout his career.” TCA is grateful to Bailey for his many contributions and his leadership in the field. We are proud of your service to our country and all you have done for Terracare Associates. Littleton, CO, January 9, 2018 – Terracare Associates- TCA, a Monarch Landscape Company is proud to announce, that it has been selected for an Award of Excellence- Merit Award by the National Association of Landscape Professionals in the commercial landscape management for multi-use properties category for services TCA provides the City of Centennial at Centennial Center Park. Recognized regionally and nationally as an award-winning park, the 11- acre park includes a 5,000-person amphitheater, a Nautilus water play area, a large shelter and plaza. This park has surpassed its goal of providing a strong sense of community. TCA has worked with the City to achieve this goal by reducing the landscaping water demands in the Park through the installation of drought-tolerant grasses and plants, including a xeric garden with plants native to Colorado. Each year, the National Association Landscape Professionals Awards of Excellence recognizes exceptional landscape, lawn care, and interior plant scape design projects from around the nation. This year only, 136 awards were bestowed for maintenance, design/build or contracting projects across the United States. Terracare is proud to have this on-going project be included in their annual selection. “It’s a team effort to ensure our customer’s properties are well maintained and are promoting water conservation. We are thrilled to receive national recognition for a job well done allowing us to celebrate our successful partnership with our customers and employees” said Dean Murphy, President of Terracare Associates. Terracare Associates- TCA, a Monarch Landscape Company, is a recognized leader in outdoor maintenance in the Western United States. For more than 30 years, our certified and experienced staff works during all seasons to improve landscapes, parks, roadways and infrastructure for beautiful, safe and sustainable outdoor environments. 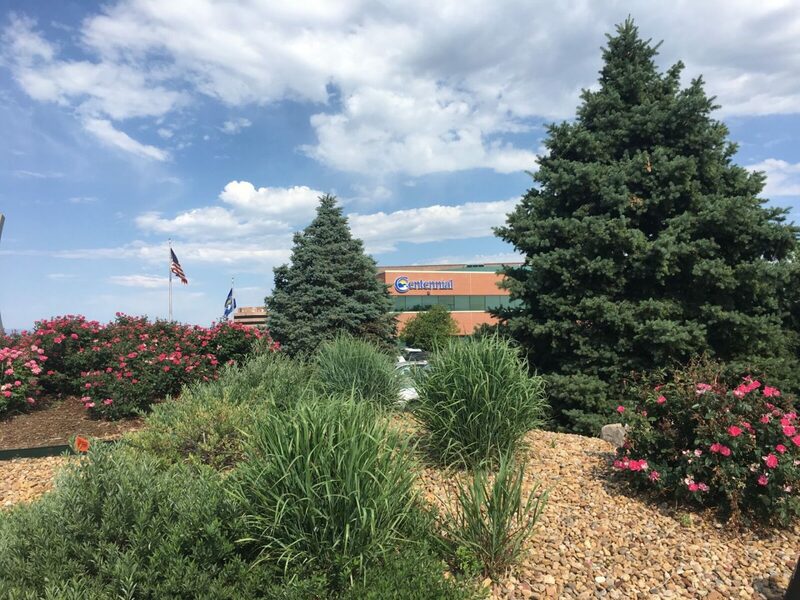 With our headquarters in Littleton, Colorado, we are proud to serve Colorado, Northern and Southern California and Texas. 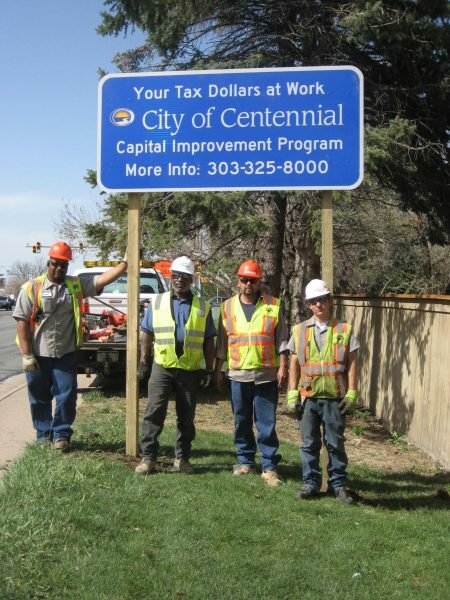 TCA has partnered with CH2M for over 10 years to provide landscape maintenance services under a Facilities, Parks and Fleet Maintenance Service contract with the City of Centennial. For more information regarding the Awards of Excellence, click here, and to view pictures of Centennial Center Park and learn more about Terracare Associates’ achievements, visit the 2017 Awards of Excellence Gallery/Centennial Center Park Application. The National Association of Landscape Professionals represents an industry that employs nearly 1 million landscape, lawn care, irrigation and tree care professionals who create and maintain healthy green spaces for the benefit of society and the environment. For more information about caring for your lawn or landscape, visit www. LoveYourLandscape.org. Training is an on-going process at Terracare Associates. Once staff is hired on, we do conduct an “All Staff” orientation in early October. 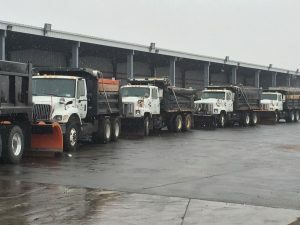 This orientation includes video training, necessary paperwork, equipment training and a driving test with a snow plow. Depending on our contracts with clients, we create curriculum and training around individual routes so our drivers are familiar with the routes before they are deployed to these routes during bad weather conditions. Our managers have thorough discussions with property managers and owners, and municipality staff to clarify the expectations of service delivery expected for each snow event. We work with property managers to plan and prepare for a variety of conditions and weather. This can include managing tree and property damage from early season storms, huge storms that may disable an area for a while and more. 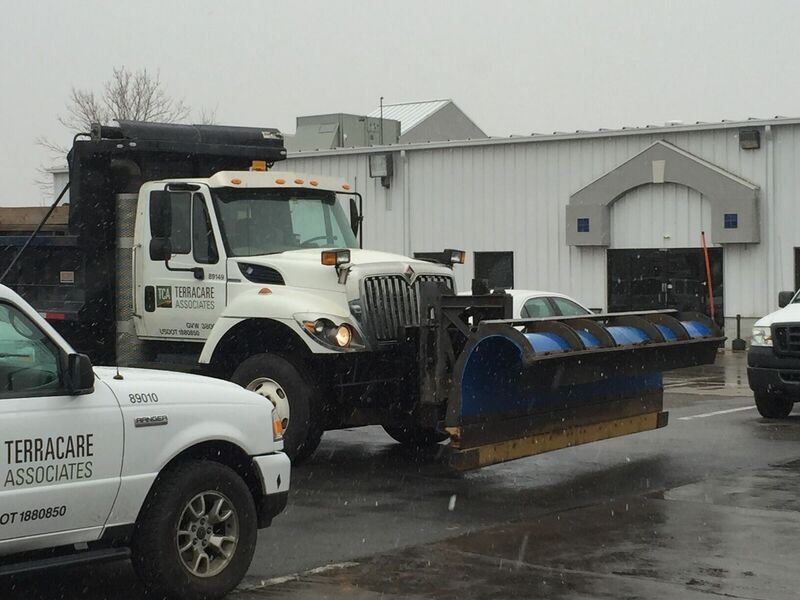 Currently, our full-time personnel have started the process of changing over our vehicles from summer work to the winter outfitting of snow plows and sanders. They are running through safety and equipment checklists that include examining and checking tires and conducting preventive maintenance. 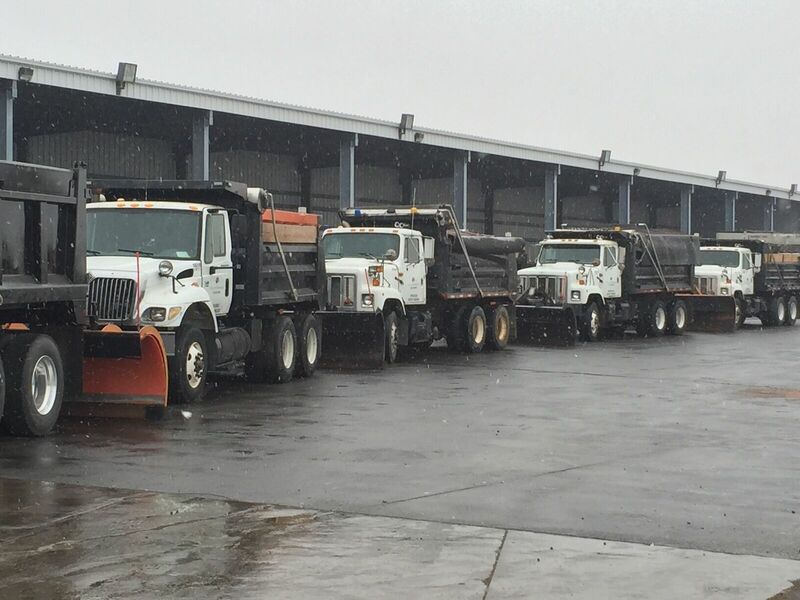 Our team is in the process of gathering, cataloging and preparing materials to combat snowy and icy conditions on the roads. We’ve placed orders on ice melt material orders for most of our municipal contracts. We will soon be ordering those same materials for the properties we currently partner with and serve. If you have not made arrangements for snow removal this season, give us a call or send us a request for proposal and a manager will be in touch to address your needs. Drive safely and stay warm. At Terracare Associates, we are committed to giving back to the communities in which we live and work. Throughout the year, we volunteer our time and resources to local nonprofit organizations and community events. Here are a few of the projects we are proud to have been a part of over the past year. Over the past year, Terracare has donated materials and time to create an outdoor learning garden at Montclair. The garden features 32 raised plant beds as well as an area to grow pumpkins, squash, melons and gourds. The goal of this project is to provide students with hands-on learning experiences that align with grade level standards while also teaching them new skills and responsibility. 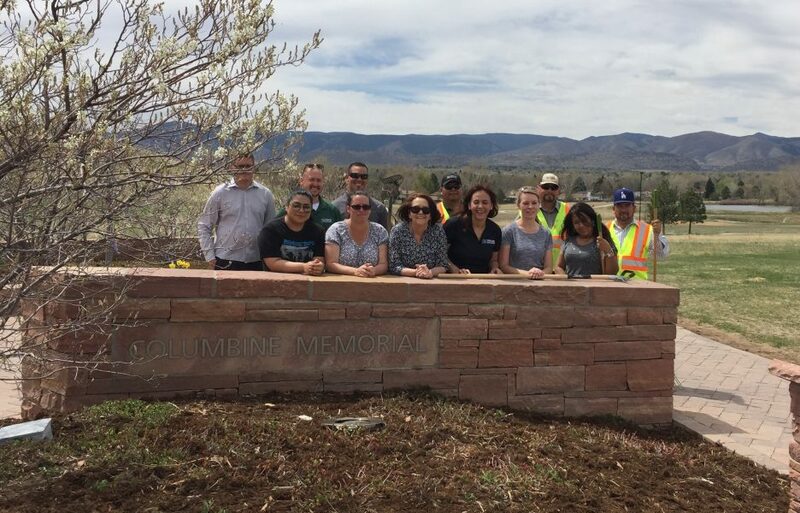 On April 17, volunteers from TCA continued our annual spring cleaning tradition at the memorial honoring those affected by the events of April 20, 1999 at Columbine High School. We are honored to continue to donate time and materials to keep the memorial looking beautiful year after year. 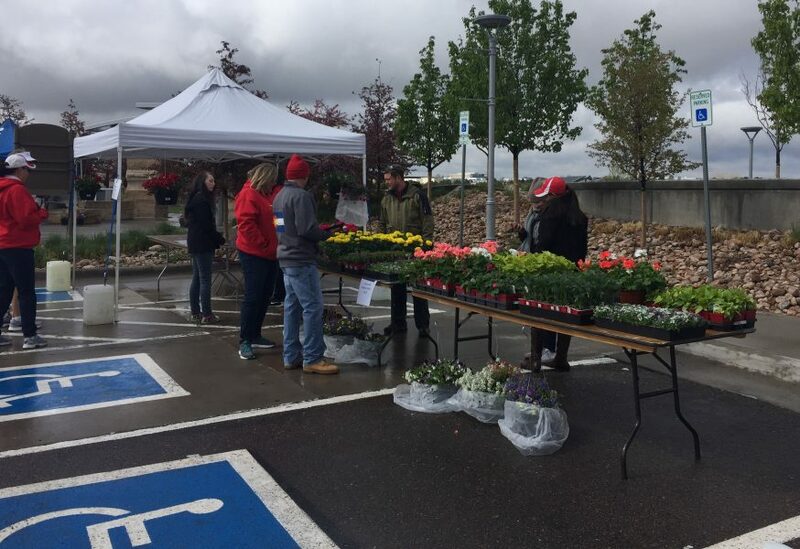 On April 22, we teamed up with CH2M and the City of Centennial to host an Earth Day Event including a plant sale benefiting Project C.U.R.E. 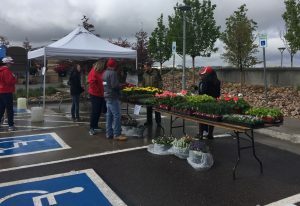 All plants were donated by TCA and CH2M and profits from the sale went directly to Project C.U.R.E. 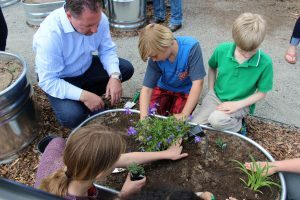 In addition to the plant sale, TCA provided free gardening demonstrations and activities for kids. 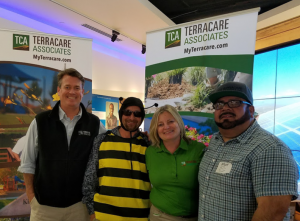 Terracare took part in Earth Day activities at the Intuit Corporate Campus in Mountain View, California on April 20. TCA offered educational seminars on beneficial bugs, drought tolerant plant material and irrigation efficiencies. In addition, one of our staff members even dressed up like a bee! Terracare is planning to attend a spring volunteer event to help the Texas Trees Foundation make a difference. Volunteers will be in charge of plant, mulch or weed nursery trees at the TXU Energy Urban Tree Farm & Education Center as well as individual sites all over the DFW Area. 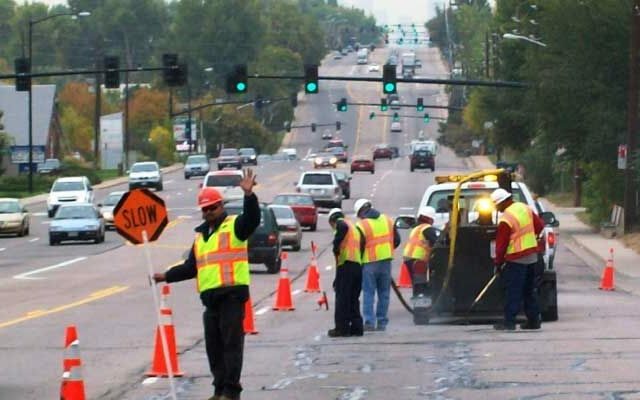 In 2008, the City of Centennial launched a large-scale public private partnership with CH2M, and Terracare Associates was selected as a subcontractor to perform comprehensive public works maintenance for the city. Of the almost 40,000 municipalities, townships and county governments in the U.S., Centennial’s public works department became the 119th accredited public works agency and the first public-private partnership public works agency in the U.S. 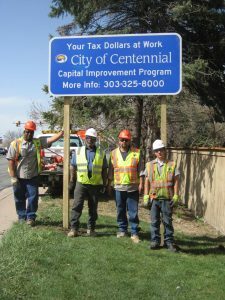 The maintenance Terracare Associates provides includes street maintenance, sign maintenance and installation, snow removal, tree maintenance and removal, traffic signal maintenance, erosion control, street sweeping, trash and debris removal, and maintenance of the award-winning Centennial Center Park. “It is a real honor to be a contributor to this accreditation. I could not be more proud of our team working every day to ensure the citizens of Centennial are safe and the city looks its best,” said Justin Stewart, Vice President of Public Infrastructure for Terracare Associates. The accreditation process is no easy feat. There are 40 chapters and 608 sub-chapters in the accreditation process in public works, 360 of those applicable to Centennial. CH2M and the city wanted to demonstrate that the city was compliant with the accreditation requirements for each applicable sub-chapter. To do so, they provided documentation of city policies backed up by actual processes and associated work proofs related to each individual accreditation service area. “This is a milestone for our city. Meeting the criteria for this accreditation confirms we have been moving in the right direction since the city was formed,” said Centennial Mayor Cathy Noon. The accreditation program aims to promote self-improvement within an organization; offer an evaluation and education program; recognize exemplary performance; improve public works performance and delivery of services; increase professionalism; and instill pride among agency staff, elected officials and the local community.